People always ask how we are able to give up the dogs once they have lived with us and we have loved them as our own. The answer is always the same, "We can't take the next ones in need if we don't let go of the ones we have". It would be selfish of us not to let them go. The last thing I whisper to each dog before it leaves me and I send it off to the life it is meant to live is, "Sweetness + Joy." Hilary is a teenager and she was diagnosed with severe anxiety and depression two years ago. We knew of her struggles and needs when we matched a pup named Noah with her family. He was sweet, sensitive and intuitive. Noah was renamed Harley and together he and Hilary have shared a journey that only a dog and his person can. I thank Hilary for being courageous enough to share her story with us. The reunion was really fun and it's certain we'll be at the next one! I just wanted to say thank you again for all the work you have done and letting me adopt Harley. He's one of the biggest reasons in helping me with my mental health. He's introduced me to more people than I can remember and makes me laugh at the silliest of things. He makes me feel calmer when I'm around people and whether I'm in the streets, ravine, or park, he's there to keep me company and living in the moment. He's even got me working at my vet's and is the unofficial mascot of it as Harley Barley, Hurricane Harley, and Harley White-Foot Davidson Chan! But I think what Harley's biggest gift to me is making me smile again. Because of that I've been able to attend school normally after 2 years of absence. My doctors tried, my family tried, even I tried, but I could not resume a normal high-school life after I was diagnosed. But Harley helped push me forward and I've never would have guessed 2 years ago that I would change into a much more confident person, who owns a dog, works at the vet's, and is going to school. Thank you so much for allowing us to adopt Lucky 11 years ago when he was 5 months, when other rescue organizations felt we would be too inexperienced as we had never owned a dog previously. Sadly, he died this past week but he has been a wonderful part of our family and he taught us much. Though seriously undernourished at his time of rescue, Lucky has a lived a confident, healthy, full and energetic life. He helped ensure we had long daily walks, he loved to run free and to play with a basketball. Fortunately for us, he did not enjoy water play as we have lots of water and a pool around us at home. A friend told us recently that he was the happiest dog she had ever seen. He wagged his tail so much I thought it must ache! He had soft fur and beautiful eyes, and a soft mouth and could gently persuade anyone hesitant with dogs to like him. He did enjoy exploring on his own on our 20 acre property, but he would always check in with us after 10-15 minutes. Lucky was always very friendly with people, and dogs - he just loved everyone. He was very intelligent and easy to train, and was the peacemaker in our family. We were indeed lucky to have him. We miss him very much and have no hesitation in recommending anyone who can offer a good home to adopt from Moosonee Puppy Rescue. Kodi (the star formerly known as Abby) was one of the Mile 26 rescue dogs. She was just a puppy at the time and, in spite of that harsh beginning to her life, she is just the happiest little girl. She loves people and (most) dogs and wants very much to be friends with the horses. She is the best cuddler and is very affectionate. While out on walks she keeps an eye on older sister China whose hearing and eyesight is fading. One picture is of her when she first arrived with the one tipped down ear, one is with China and the other is as her confident grown-up self. 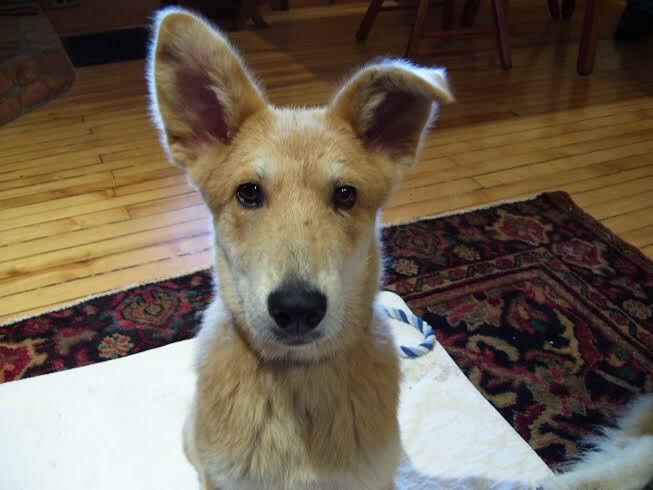 Like Bernadette, the first dog who came to us from MPR, Kodi is a wonderful example of the character and resilience of the northern dogs. Thanks so much for bringing her to us. Just a note to let you know that our beloved Mickey died this week. We selected her from your dog rescue 12 years ago. I must thank you for letting her be a part of our family for the last 12 years as she was very loved and looked after. Her love of the outdoors and mild temperament made her the perfect dog to go on many adventures with. Mickey loved going to our cottage, swimming and she loved her daily walks. You did a great thing by rescuing her and finding her a great home. Just wanted to give you guys an update on our furry kids!! We didn't realize how much Cooper loved Bailey, until they were apart. Bailey was overnight at the Vets for her spaying and Cooper moped around the house for two days!! We can't thank you enough for bringing us together with these two wonderful Northern dogs. They really are a perfect pair and its so much fun to watch them play together. I seriously do not know how we only ever had one dog. Two dogs are way more entertaining, especially when they are as fun loving and smart as these two are. Thank you for ALL that you do! We cannot even imagine, not having these guys in our lives! Love them so much!! I am sending you an update on the puppy Gallant, that we adopted in December. We call him Friday, as in “Thank god it’s Friday!”. I have to tell you he is indeed a marvelous pup, as you described. He is the love of our lives. He is gentle with children, plays well with other dogs, is a delight at the office (this photo was taken by a coworker) and generally pure joy in a little fur jacket. We took him on a road trip over Easter to Ellicottville to visit a family with a six year old and a two year old. He could not have been sweeter. And I don’t need to tell you how much he loved frolicking in the snow! We meet lots of Moosonee dogs all over the place – one is part of a pair that were called (I think) Emerald and Diamond. We are now always on the lookout. Friday walks off leash now with me in the ravine behind the house, and I totally trust him not to run off. His routine is to get up with me at around 7am, we walk for an hour or so including a play in the park with other dogs. Then he either stays home with Rajiv or comes with me to work. At 5:30 he goes to the “dog club” in the park in front of our house and plays with Poppy and other favorite friends. He will never be very fast because of his broken leg, but he is running around like crazy anyway and although he occasionally gets toppled over by other dogs I let him figure it out as he loves to play. This morning I met a lady in the park with a 7 month old puppy (same age as Friday) and she said “oh I never let him off the leash” so I said “let him off Friday will make sure he stays close by” and they played for the next two hours including a long walk in the ravine. He is THAT good. He loves to eat, eat, eat, I can see we will have to make sure he does not get fat, but so far so good. He sometimes sleeps on our bed and sometimes on the floor on his mat, he decides! Thank you, thank you, thank you for bringing this shining star in to our lives. What great work you do. PS - Sharron, this little toddler loved Friday! The first thing he said every morning was “Where is Friday?”. Friday was totally loving to him and let him crawl all over him. What wonderful dogs these Northern dogs are! I hope you're well. It's been over a year now that we've had Luke (formerly Frankincense), and he's just the best dog anyone could ever hope for. He's polite, caring and just so sweet and handsome. We are so glad we got a puppy from you, we couldn't imagine not having Luke in our lives. Please keep doing what you're doing; you do it so well! Just wanted to update you on our wonderful rescue dog Wolfie. We welcomed Wolfie into our home 4 and 1/2 years ago. He has given so much to us unconditionally and we can't imagine not having him. I've attached a picture. Thank you for what you do. Your organization is terrific and I recommend it whenever I can. Just wanted to give an update on Rally (adopted February, 2014). He is the perfect addition to our family and we are so grateful to you for bringing him into our lives. He is the sweetest most well behaved boy!!!!! He has sooooo much love to give. He adores his car rides and comes to work with me. He has finally figured out the horses now and has learned that the cats OWN the barn. His favourite times are walks on our trails and tearing around our yard in a frenzy of happiness. We hope you realize the positive impact you have on so many lives, human and canine!